Bonavista, NL (September 18, 2017) After months of hard work and fundraising by 10 dedicated teams across the globe, Obakki Foundation is thrilled to announce the winners of its annual Live With a Purpose campaign. Newfoundland’s Karen and Chris Ricketts have earned a life-changing, philanthropic mission to Cameroon, Africa with their ‘Caring Hearts’ creative initative, raising more than $10,000 towards saving and changing lives. In just its third year, Live With a Purpose has raised more than $100,000 to better the lives of many well-deserving families in African communities through creative and self-directed fundraising. As contest winners, the Ricketts’ receive an all-expenses paid trip to Cameroon, Africa this November with Obakki Foundation founder, Treana Peake. There, they will work alongside Peake, her team and members of Cameroon communities to build sustainable development projects, aiding in the long term fulfillment and success for the area. The couple have been longtime supporters of Obakki Foundation since Ricketts’ sister, Cheryl Shatford won the first ‘Live With a Purpose’ campaign in 2015. 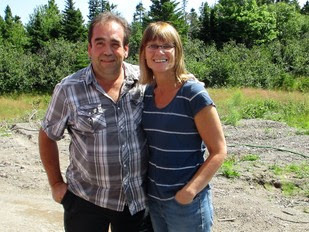 After being inspired by Shatford’s own experience, the pair decided to take part themselves with ‘Caring Hearts’, donating part proceeds from their gift shop and fine art gallery at Round Da Bay Inn in Bonavista Bay, Newfoundland. The Ricketts will get a true behind-the-scenes view of what the Obakki Foundation does, the effects of the programs, and immerse themselves in Cameroonian culture. Combined with the other teams, Live With a Purpose 2017 has raised more than $21,000 for the Cameroon area. To learn more about Live With a Purpose and to see the journey with last year’s winners, please visit www.ObakkiFoundation.org.